The MorphOS team has a more active release schedule than the Hyperion AmigaOS team. They’ve just released MorphOS 3.6 for download, just months after releasing v3.5.1. I think I’m most interested in their support for Airport Extreme wifi cards built into many powerpc macs. The fastest Amiga 68k accelerator is almost ready, and it’s only for the Amiga 600 at the moment. 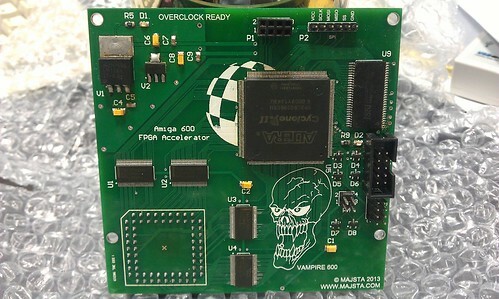 The Vampire 600, designed by Majasta, is prepping for the Phoenix core, a shrunken version of the Apollo core which will provide 68000 level instruction set at 100MIPs, faster than most Amigas even with 68060’s. Kipper2K has taken over production for now. Price is $125 USD. After 20+ years, MUI for AmigaOS3.x/68k users is getting bumped from 3.8 to 3.9. I believe release 3 of MUI3.9 was just released. Check out their website. Over at Amigans.net, danbeaver just posted how to get an Amiga printer to work with USB printers. This looks handy! A British group is selling the Cyclone RX adapter, which allows the Amiga to use Playstation controllers (most likely PS1). They are selling on ebay it appears. And finally, there is a side scrolling game released for both Amiga and CD32 consoles using the Backbone game dev system (free on Aminet). The CD32 ISO and LHA files are downloadable. Okay, so it is with great sadness that I had to abandon my Amiga 1200 Classic Tower project. Funds and time didn’t allow me to work on everything I needed to, so something had to go. In fact more than one something. My first step was to sell the Angled PCMCIA adapter. The motherboard I had seemed to have a damaged PCMCIA port so I couldn’t use it anyway. Next, my main tower, which was a Micronik Infinitive, along with the A1200 rev2B board, as well as the Micronik 6860 ZorroII busboard, powersupply and adapters went into it as well. I also sold the GVP accelerator and all 36MB (2x16MB and 1x4MB) GVP custom SIMMs were sold as well. Still no shortage of collectors out there. I also am selling a spare parts tower too. I’ve decided to focus on two new projects, which I’ll blog more about soon. One is based on NextGen technology. I have 2 Eyetech AmigaOne boards, one is XE and the other is Micro. I’m also prepping to sell the A1XE machine (motherboard and case and expansion cards), and just focus on the Micro for now. The new projects will be fun, I have no doubt! The funds from selling the tower project will help bring this to fruition.